How many were crucified with Jesus? | Truth Or Tradition? It is commonly believed that our Lord Jesus Christ was crucified along with two other men, and that his cross was between theirs. This belief has been portrayed in many different ways, including pictures, television, movies, bumper stickers, crosses along the roadside, and crosses in church yards. If we look more deeply into the Word of God, however, we learn that there were not two other men crucified with Jesus, but four other men, two on each side of Jesus. Although this may seem like a minor point, there is value in truth, and much value in being able to read and understand the whole Bible and see that it does not contain contradictions. If there were only two men crucified with Jesus, then there are verses in the Four Gospels that would contradict each other. Realizing that there were four men crucified next to Jesus gets rid of the apparent contradictions and difficulties, and very importantly, gives us a true picture of what the crucifixion scene was like. It takes careful reading of a good translation, and paying attention to detail, to realize the truth that the Word of God is presenting. We must always keep in mind that the Word of God cannot contradict itself. Also, it takes some courage to challenge long-held traditions. During the Reformation many traditions that had been held for hundreds of years were recognized to be only tradition and not truth, and the traditions that were done away with were replaced with truth. That kind of reformation needs to continue today. Jesus challenged the traditions of his time (Matt. 15:1-3) and when traditions do not fit with the Word of God, we must be willing to change them. 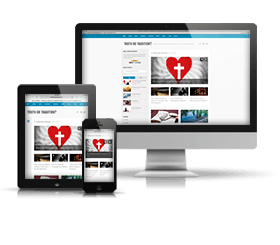 When we first start to piece together the whole narrative, the whole record, of Jesus Christ’s crucifixion, we will note that there are some significant differences between the Gospel records. Sometimes, this is just different detail, but sometimes the difference is so great that the information cannot be about the same thing or event. At first we may not really know whether we are dealing with just differences in detail or completely different things, so we just make note of the differences and see how important they are as the whole picture develops. One difference that we should note as we read the crucifixion records is that Matthew 27:38 (ESV) and Mark 15:27 (ESV) clearly state that there were “two robbers” crucified, while Luke 23:32 (ESV) says there were “two criminals” crucified. Other versions such as the NIV, NASB, and RSV also use the translations “robber” and “criminal,” while other versions use different words, such as “thief” and “malefactor” (KJV). While it is clear that a robber is a criminal, and so these might be the same set of two men, it should nevertheless catch our attention that the Bible uses different Greek words, lēstēs (robber) and kakourgos (criminal) to describe them, so perhaps they are different sets of men. It becomes much more likely that they are two different sets of men when we add the piece of evidence that Matthew says the robbers (lēstēs) reviled Christ but Luke says that only one of the criminals (kakourgos) did. (40) But the other rebuked him, saying, “Do you not fear God, since you are under the same sentence of condemnation? It has sometimes been taught that one of the criminals started to revile Jesus, but then changed his mind and rebuked the other criminal instead. However, the substance of what this criminal said does not support that. The priests, robbers, and one criminal were reviling Jesus because they thought he was a fake, an imposter. They said such things as, “If you are the Son of God, come down from the cross…let him come down now from the cross, and we will believe in him… let God deliver him now, if he desires him. For he said, ‘I am the Son of God’” (Matt. 27:40-43 ESV abbreviated). It is very unlikely that Jesus could have done anything on the cross that would have totally changed the mind of a criminal who believed he was a fake and get him to believe he was the Promised Messiah instead. Another very important and powerful piece of evidence that leads to the conclusion that the robbers and criminals are not the same men is that they were not crucified at the same time. A careful reading of the biblical text shows that the two criminals were crucified at the same time Jesus was, but the two robbers were crucified later in the day. 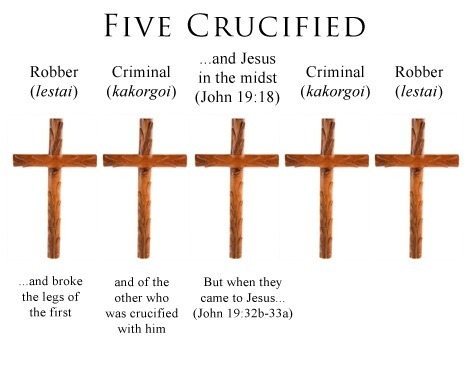 The criminals were led away to be crucified with Jesus, and were immediately crucified next to him. (32) Two others, who were criminals, were led away to be put to death with him. (33) And when they came to the place that is called The Skull, there they crucified him, and the criminals, one on his right and one on his left. (35) And when they had crucified him, they divided his garments among them by casting lots. (36) Then they sat down and kept watch over him there. (38) Then two robbers were crucified with him, one on the right and one on the left. What we have seen so far is that the gospel of Luke tells us that two criminals (kakourgos) were led with Jesus when he was led forth to be crucified. Matthew and Mark stated that there were two robbers (lēstēs) crucified with Jesus after the garments had been parted and the soldiers had sat down and watched, or guarded, him. Matthew and Mark record that both “robbers” reviled Christ, while Luke tells us that one criminal reviled Christ while the other rebuked the criminal and asked Christ to remember him. It seems that from reading Matthew, Mark, and Luke, and by using the principle of narrative development, we can conclude that there were four other men, not just two other men, who were crucified with Jesus. Now we turn our attention to the gospel of John. John seems to be less interested in the timing of the flow of the events, and more concerned with the “where” of the crucifixion, because John 19:18 opens with the word “there” (which is even better translated “where,” as in the KJV). Thus, rather than recount the flow of events as they happen, John gives us more of a “summary statement” of the situation. (17) and he went out, bearing his own cross, to the place called The Place of a Skull, which in Aramaic is called Golgotha. (18) There they crucified him, and with him two others, one on either side, and Jesus between them. and with him others two on this side and on that side middle but the Jesus. The Greek word order is slightly different that the English word order, so we could literally translate that as: “and with him two others on this side and on that side, but Jesus in the middle.” This would make it clear that there were two others “on this side” and two others “on that side.” However, the phrase enteuthen kai enteuthen is somewhat idiomatic and is perhaps better translated into English as “on either side.” It is helpful to know that the phrase enteuthen kai enteuthen appears one other time in the Bible, in Revelation 22:2, which is referring to the tree of life growing “on either side” of the River of Life. If John 19:18 was translated the same way as Revelation 22:2, but with the recognition that duo, “two,” immediately precedes enteuthen kai enteuthen , we would have, “two on either side.” Actually, the ESV version would be very accurate if the commas, which are not in the Greek text but were added by translators, and the word “one,” which was also added, were omitted. It would read, “There they crucified him and with him two others on either side and Jesus between them.” This is the simple truth of Scripture. There were four others crucified with Jesus, as John says, two others on either side. There is another piece of very solid evidence that there were four others crucified with Jesus, not just two, and is has to do with the soldiers breaking the legs of the men who were crucified. (32) So the soldiers came and broke the legs of the first, and of the other who had been crucified with him. (33) But when they came to Jesus and saw that he was already dead, they did not break his legs. John 19:32 and 33 do not make any sense if there were only two men crucified with Jesus. If that were the case, the soldiers would break the legs of the first man, and then come to Jesus. But that is not what these verses say. If we can get a mental picture of the five men being crucified, here is what we would see: Jesus would be in the middle, and next to him on both sides would be the criminals, who were crucified at the same time he was. Then, on the outside of the criminals and further from Jesus would be the two robbers. If we read the verses with that picture in mind, they fit perfectly. The soldiers were commanded to break the legs of those who were being crucified so they would die faster. Naturally, they started on the outside and then went down the line. They broke the legs of “the first,” that is, the first man they came to. Then they broke the legs of the next man, “who had been crucified with him.” That is exactly correct! The criminal next to Jesus had indeed been crucified with him, while the robber, the first man to get his legs broken, had been crucified much later. Then, when the soldiers “came to” the third man in line, which was Jesus, they found him already dead. Jesus was the focal person, so there was no need for John to say that the soldiers then went around Jesus and broke the legs of the other two men. It is significant that the soldiers did not break Jesus’ legs just to “make sure” he was dead. The Bible prophesied that none of the bones of the Savior would be broken. The Passover lamb was not to have any broken bones, and Jesus was the Passover lamb that year (Exod. 12:46; Num. 9:12; Ps. 34:20). The record of the four others crucified with Jesus is similar to other records in the Gospels where all the Gospels must be read and compared to get the full picture of what really happened. A good example is Jesus meeting the men from the tombs who were controlled by demons. If we read only Mark 5 and Luke 8, we are convinced that when Jesus landed on the shore of the Sea of Galilee, one fierce man controlled by demons and who lived in the tombs met him, and he cast the demons out of that man. However, when we read the same record in Matthew 8, we find there are two men, not just one. Mark and Luke simply never mention the second man. In the same way, when it comes to the crucifixion, Matthew and Mark focus only on the two robbers while Luke focuses on the two criminals, and only the gospel of John speaks of all four men. God places great truths in His Word, but sometimes it takes some searching to find them. However, the diligent student of Scripture works the Word very hard to ferret out truth. It is sad that sometimes people take the traditions of man as truth and then see “discrepancies” in the Bible rather than remembering that the Word of God does not contain any contradictions, so apparent contradictions will disappear if we keep studying. E. W. Bullinger writes: “From this evidence, therefore, it is clear that there were four “others” crucified with the Lord; and thus, on the one hand, there are no “discrepancies,” as alleged; while on the other hand every word and every expression, in the Greek, gets (and gives) its own exact value, and its full significance” (Bullinger, The Companion Bible, Appendix 164). This study of the five crucified shows how to work God’s Word from the inside to the outside and discover the truth of the Word. 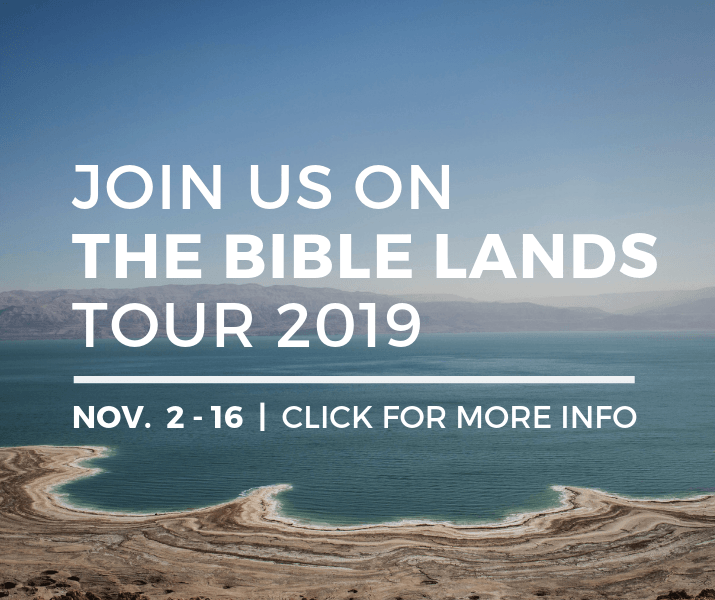 Once we grasp that concept, we can begin a journey into the Bible that will answer many, many questions for us and help us to see why God magnified His Word above His name. Scripture quotations marked (YLT) are taken from Young’s Literal Translation, by Robert Young, 1898. While there is nothing inconsistent with there being four people crucified with Jesus, it seems your entire argument turns on Matthew’s use of _tote_ instead of _kai_ in connecting the robbers to the crucifixion. This emphasis seems misplaced. First, Mark does use the word “kai” when connecting the robbers (you never quote Mark on this point). Second, “tote” has two ideas, “at that time” and “then”. So, while “then” is a plausible translation, we could also translate Matthew’s connecting word as “at that time” which would indicate that this all happened together. Even more, in the reconstruction that you have, you have Jesus crucified with two criminals and the robbers come in later (with your reliance on “then” in Matthew). While this fits the picture you have on your page, it doesn’t fit your argument or your text, where you say, “Jesus would be in the middle, and next to him on both sides would be the robbers, who were crucified at the same time he was. Then, on the outside of the robbers and further from Jesus would be the two criminals.” It seems you want the robbers crucified at the same time and after Jesus. Very interesting, an eye opener as the Holy Spirit has started dealing with me not to just accept what we have been taught over the years but to start studying it for myself. Thank you for an awesome site. Another example is that we think there were exactly THREE wise men who gave gifts to Jesus. The text does not state the number of the men, but states gold, frankincense and myrrh as gifts. So two wise men could have given gold, two gave frankincense and so on. All we know is that there were at least two wise men. God’s Word is so amazingly perfect… Mind blowing! Thanks so much for digging out and sharing the truths found in this section. Praise God for His Word! Yeshua was probably even born on the Mount of Olives as oftentimes Jews would camp there during the pilgrimage yearly feasts of Yahveh. Yeshua taught there, was arrested there, was crucified there, was buried and resurrected there, ascended there, and will return there. This is the place He was impaled on an olive tree with two other men by His side so when the guard got around the tree to Yeshua after having done the first two found Him dead already. No one actually knows if the cross beam was on a post or a olive tree since the Romans did use both. It does make sense that it was an olive tree since that would have been readily available. “How can you say, “Jesus was born on the Mt. of Olive” when the prophecy was, and the Bible says, he was born in Bethlehem? Very interesting and education . This is a full narrative development.